Apple has just released a new set of numbers for the distribution of major iOS versions in an update to its App Store Distribution developer webpage. Based on data measured by the App Store during a seven‑day period ended yesterday, July 13, the current major version of Apple's mobile operating system, iOS 7, is now running on 90 percent of iOS devices, 10 months after its release. This closely matches a report published by Chitika Insights late last May, which quantified iOS 7 adoption at 90 percent on iPhones and 85 percent on iPads. 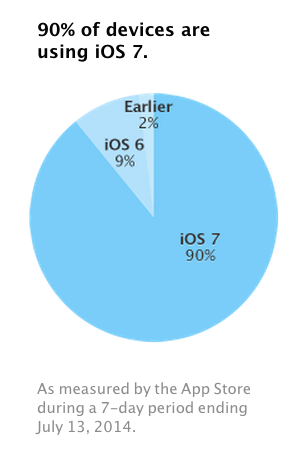 As for the adoption of the previous major version, iOS 6, Apple's new distribution chart (shown above) has it at 9 percent, with earlier versions at a combined 2 percent. As noted by MacRumors, the previous official installation numbers, released by Apple last April, had iOS 7 adoption at 87 percent, iOS 6 at 11 percent, and earlier versions at 2 percent. The 3-percent increase in iOS 7 adoption suggests that more iOS device users have updated to the current mobile operating system, even as the launch of the next major iteration, iOS 8, draws near. Scheduled to be launched this fall, the upcoming software update retains the overall design introduced by Apple in iOS 7 but comes with significant new features, including a new Health app, major enhancements to Siri, ephemeral messaging, and more. 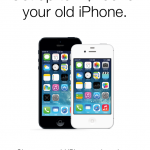 See also: Apple is set to release iOS 8 beta 4 on July 28.